Welcome back to our week-long focus on my children's picture book, I'm Not Weird, I Have SPD. For those just joining us, October is Sensory Awareness Month. To celebrate this, I'll be shining the spotlight on one of the four books I've written with an SPD theme, and you'll have a chance to win an autographed copy of each book. Today, I'll share the story behind my writing this book. I wrote this book for my oldest daughter, Jaimie, after a heartbreaking experience at a local park. Jaimie was born with SPD. I'm absolutely positive she was. There still isn't solid research to prove undoubtely that people living with SPD are born that way or if something goes wrong during their development. All I knew was that Jaimie didn't react or respond to people, experiences or stimuli the same way other babies did. She didn't like being touched or sung to or hugged or cuddled. She didn't like playing with toys or being read to. She hated her bath, having her hair brushed, brushing her teeth, wearing anything that wasn't a onesie or tight-fitting. She had to have everything stay the same, no surprises. She couldn't deal with the noise, chatter, brightness and bustle of parks, malls or other public places. And she cried all of the time. Not just normal baby crying but a high-pitched, shrill screech that could go on for hours. What seemed to comfort her was even more odd. She didn't like being held or comforted but she would tolerate it if I swung her. But it couldn't be a gentle rocking; it had to be where I'd be swinging her with such force I was afraid she'd go flying if I didn't have a good hold on her. She didn't like many sounds or noises but, oddly, needed to have white noise in the background, like running water or the sound the television made when the station went off the air (eg: static noise). Life with her for the first two years of her life were torturous. Not only did we not understand why she was behaving the way she was, or even know where to turn to for answers, we couldn't even offer her any comfort because touching her or talking to her only seemed to make things worse. When she was two-and-a-half, an occupational therapist (OT) who came to work with Jaimie finally gave me a name for what Jaimie lived with: Sensory Processing Disorder. In a nutshell, SPD is a disorder that interferes with how the brain processes and interprets sensory information. Information is taken in through the sensory organs and the messages are sent up to the brain for processing, but somewhere along the way through the nervous system, those messages get 'scrambled'. The brain doesn't understand the messages and, therefore, doesn't know how to tell the body to react to the stimuli. And because the body doesn't know how to react, a person can feel quite confused and overwhelmed when faced with any sort of stimuli. That's what was happening to Jaimie. She'd come in contact with something or someone and not understand how her body was supposed to respond. Her brain wasn't giving her body the 'right' messages to interact or respond to things. What happened was she eventually started to fear how her body felt during certain experiences and avoided them altogether. That was hurtful because she really did withdraw so deeply into herself, we thought she'd never come out. With alot of help and alot of therapy, she did. She still has to work on things every day, but she is finally in a place where she understands how things affect her, what tools she needs to calm down and can verbalize those needs. 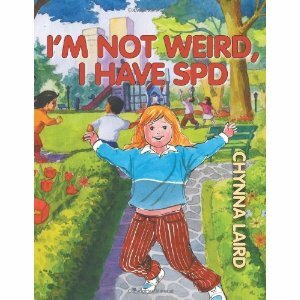 I'm Not Weird, I Have SPD was written as one of the initial tools to assist Jaimie in communicating her needs. I wrote it after we were at the park one afternoon and Jaimie took off because a few kids tried playing with her. She didn't understand how to interact with them, and got scared. The kids made fun of her. Of course, we all make fun of things we don't understand...especially children. So, I decided Jaimie and her peers needed that understanding. I guess you could say it was one of my first steps in advocating for Jaimie. And that's the story of this book. If you'd like a chance to win a copy, be sure to click HERE to be taken to yesterday's post to comment to enter. Tomorrow, I'd like to talk about some of the bonus features in the new edition. Hope to see you back! I didn't know this site existed! This is awesome! I would love so much to win the book or books about on SPD. I deal love and teach these students every day. I have a Sensory Room within my school that my paras and I started and was so graciously allowed to put together for the Autistic/Bi-Polar/ADHD, etc. students that we deal with every day. What an amazing difference it makes in the day of a child with Sensory Integration issues in helping them process and learn within the classroom and to stay focused and de-escalated. This is a subject I totally believe in and KNOW the difference addressing SPD issues can make in the life of a child's life.